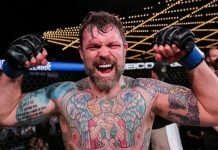 Throughout his MMA career, light heavyweight fan favorite Sean O’Connell has delighted us with his tradition of hilarious interactions with his opponents at the weigh-ins for each of his fights. See the pair’s awesome and surely delicious exchange above. 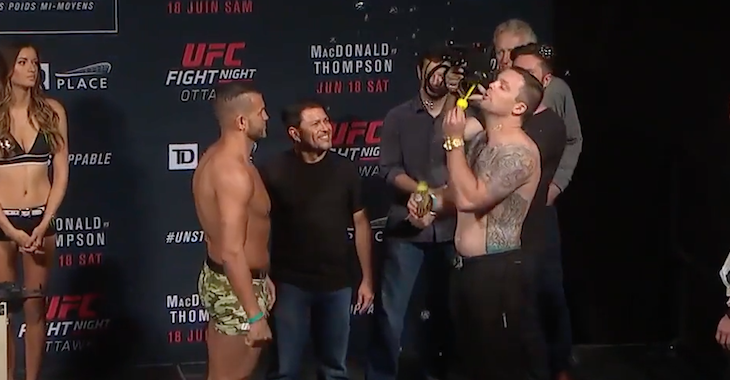 As mentioned in the text above, this is certainly not the first time O’Connell has interacted with his opponent at the weigh ins in this fashion. In the past, he’s given his foes bouquets, engaged them in games of rock, paper, scissors, shared his drinks with them, and more. See some of the highlights of his weigh-in antics here. Sean O’Connell has not fought since December of 2016, when he suffered a TKO loss to Corey Anderson in his final UFC bout. 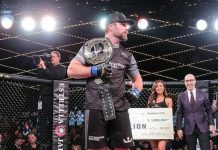 The light heavyweight, who is famous for his unforgettable 2016 war with Steve Bosse, enters this PFL season with an overall record of 17-9.